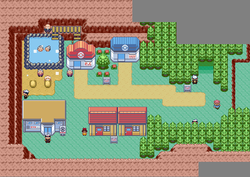 Lavaridge Town is where you can win the fourth Gym Badge, the Heat Badge, from Gym Leader Flannery. The town is in a volcanic region and is famous for saunas that contain spring water. This shop is the first house east of the Gym. It sells a small range of herbs that are very effective, although don't buy too many of them, because if you keep feeding your Pokémon bitter items, its love for you will wane. Talk to a man in the shop and he will give you Charcoal, a hold item that raises the power of Fire-type moves. 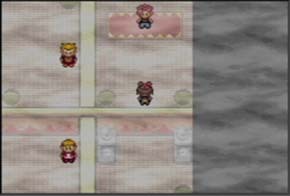 In the second house east of the gym their is a little girl in their that will give you Mimic a move that you can choose to learn only once, the move is a Normal type move that "Copies a move used by the foe during one battle. This Gym's specialty is Fire Pokémon, so you will want to have Water-, Ground-, or Rock-type Pokémon at the ready. The Gym has a bathhouse layout with holes that makes players fall down and steam geysers that send players up a level. To reach Flannery, you have to go through the correct series of water-holes. After defeating Flannery, she will award you with the Heat Badge and also TM50 Overheat. Outside, you will meet your rival and they will give you the Go-Goggles which protect your eyes enough to allow you to enter deserts. The next gym leader to face is your father, Norman of the Petalburg City Gym. You have another long trek ahead of you to reach Petalburg City. 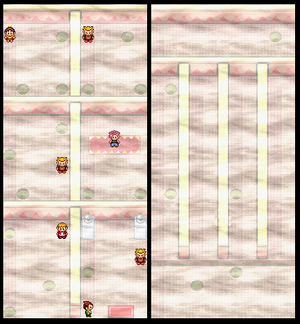 The easiest route is to again head back to Rustboro City via Mauville City, Verdanturf Town, and then Rusturf Tunnel. From Rustboro, journey south through Petalburg Forest to reach Petalburg City. Once you reach the Gym, click here for trainer details, before continuing on to Route 118. This page has been accessed 238,207 times.